This healthy Chick Fil A frosted lemonade recipe is totally life changing. Paleo and vegan, this frosty summer treat is creamy, tangy, and refreshing, with no unhealthy ingredients! Perfect for the spring and summer, and you’ll feel great about serving it to your family. Perfect made with a high-speed blender like my favorite Vitamix. I’m not one to get too hyperbolic too often (That’s a lie), but this healthy Chick Fil Afrosted lemonade recipe is life changing. I have a thing for the frosted lemonade from Chick-Fil-A. I crave it every time I’m sick or getting over a stomach bug, and I wanted nothing but that for a couple weeks when I was in my first trimester this time. We don’t eat there often by any means, but I’ll occasionally go way out of my way to hook a sister up with this stuff. The problem is, I don’t have a thing for what’s in the frosted lemonade there. 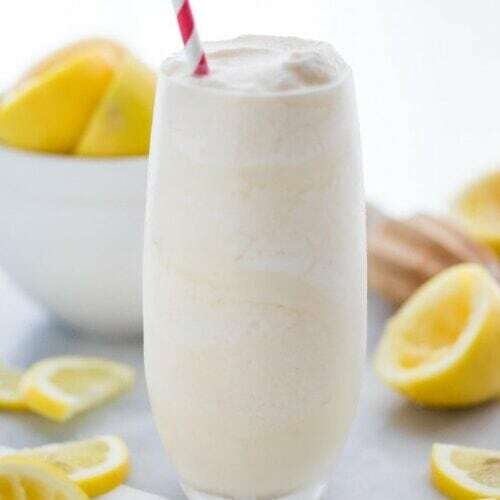 Icedream (milkfat and nonfat milk, sugar, contains less than 1% of: natural and artificial flavor, mono & diglycerides, guar gum, carrageenan, beta carotene [color]), water, freshly-squeezed lemon juice, sugar. And hey – it could be worse! It almost always is with fast and processed foods, but a bunch of sugar (63 grams! ), “artificial flavor,” carrageenan? Pass. 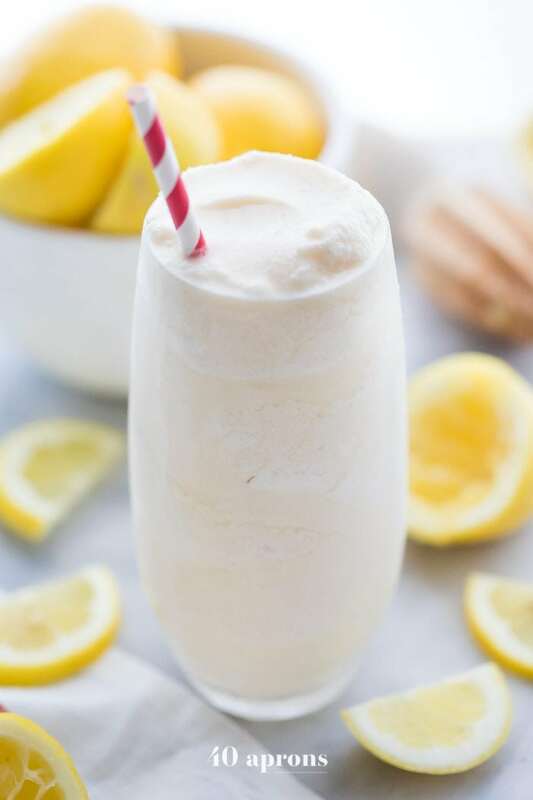 So, instead of just moving past this perma-craving, I decided I absolutely had to create a paleo and vegan healthy frosted lemonade recipe that’s dairy-free, refined-sugar-free, and totally guilt-free. I loaded it up with only a few ingredients: unsweetened almond yogurt and coconut cream, fresh lemon juice, honey (or maple syrup for vegan), and a touch of vanilla extract. Oh… and tons of ice, of course. It uses simple ingredients that you likely have on hand already. 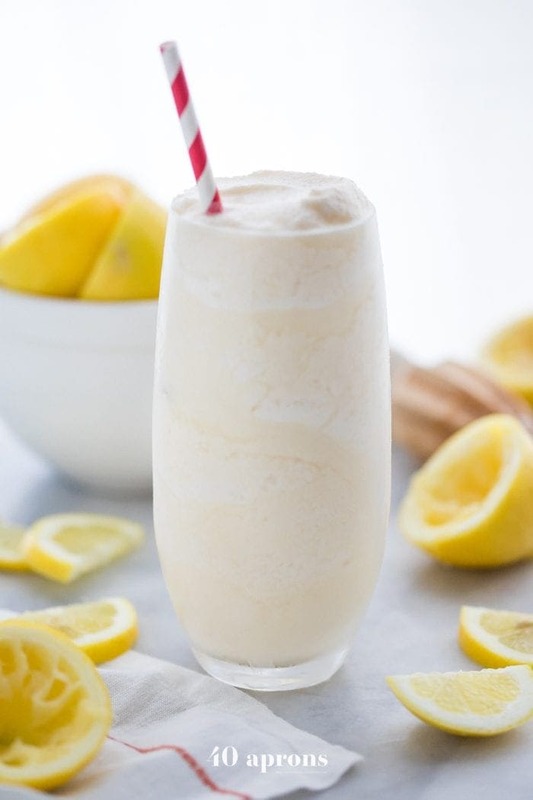 Using honey or maple syrup makes this healthy Chick Fil A frosted lemonade guilt-free! This healthy Chick Fil A frosted lemonade recipe is dairy-free, too, but so full of creamy flavor and lovely tang. This healthy Chick Fil A frosted lemonade recipe is absolutely going to revolutionize your summer! After we whipped up the first one, my assistant and I sat around groaning about how unbelievably good it was: creamy and refreshing, sweet but not too sweet, tangy and perfect. We seriously bemoaned the pending disappearance of the healthy frosted lemonade batch I’d made, knowing we should probably not make an entire new batch but also what would our lives be without them?! And the best part is that I feel great about giving it to my toddler or sipping a glass pregnant. 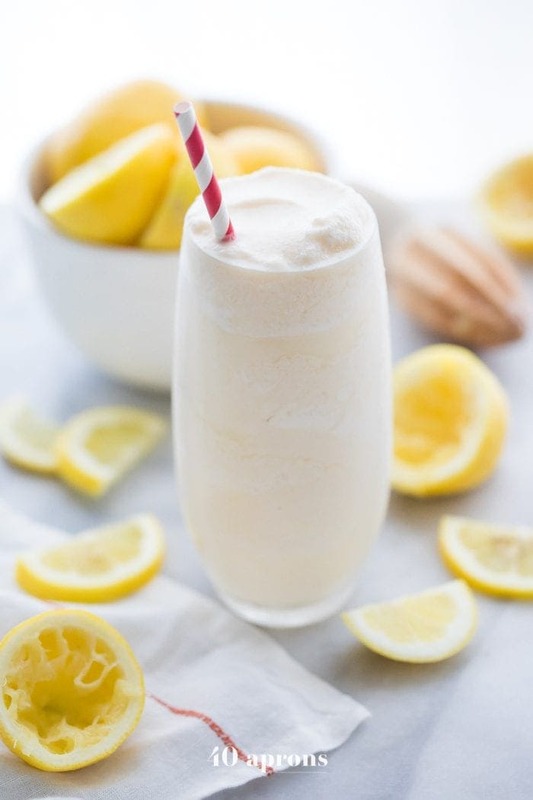 Both the paleo and vegan versions of this healthy Chick Fil A frosted lemonade recipe are loaded with nourishing foods: vitamin C-rich citrus, probiotic-laden yogurt, healthy-fat-heavy coconut cream, and that powerhouse: raw local honey. Of course, if you’re vegan, the swap for maple syrup is still a great one: sweet and rich with plenty of vitamins and minerals. This healthy Chick Fil A frosted lemonade comes together easily, too: I blended the liquids together and then chilled them for a little while. Then I crushed ice in my blender and poured in the lemonade liquid before whirring it all together one last time. So easy! And you can easily skip the chilling step, plus, if your fridge makes crushed ice, you’re all set. See? Life changing. Combine all ingredients except for ice in a high-speed blender. Pulse until well combined, then transfer the mixture to a container. Chill if desired – this will create an even frostier version of this healthy Chick Fil A frosted lemonade! Add the ice to your blender and pulse until the ice is very fine, almost like a snocone. Don’t overprocess, though! You don’t want to turn it back into water. Add chilled lemonade mixture to crushed ice and pulse a few times until thick and frosty. Serve immediately. Add in a handful of raspberries or strawberries for a frosted pink lemonade treat. Swap orange juice for the lemon juice and reduce the honey or sweetener a bit for a Creamsicle-inspired bev. What if I don’t have a high-speed blender? That’s OK! You’ll just have to process your ice a little longer and might want to work in batches. This healthy Chick Fil A frosted lemonade recipe is tangy, creamy, and perfectly sweet. Dairy-free and made with no refined sugars, this cold summer treat is totally guilt-free. Easy, too! In a blender, blend together all ingredients except for ice. If your liquid is warm at all, chill first before the next step. Right before serving: If your ice is not crushed, add it to your blender and pulse a few times until crushed and all big pieces are broken down. Add chilled lemon mixture and pulse until combined but frosty and smooth. Scrape into two serving glasses. Mm this was soo good! I added in a piece of lemon peel to pump up the lemon flavor. Delish. Wow! This is just what we needed for summer! We have made this twice, once with honey and the second time with maple syrup and a little more lemon juice and THAT time it was UNBELIEVABLE! Sounds delicious! Could you sub something else for the almond yogurt, like more coconut cream, or is that a crucial ingredient to the flavor? Wow! This was delicious and so simple to make! My kids and I loved it. Thank you for sharing this recipe!